KOJO was approached to design and build an entirely new school website with a focus on what parents wanted to see. 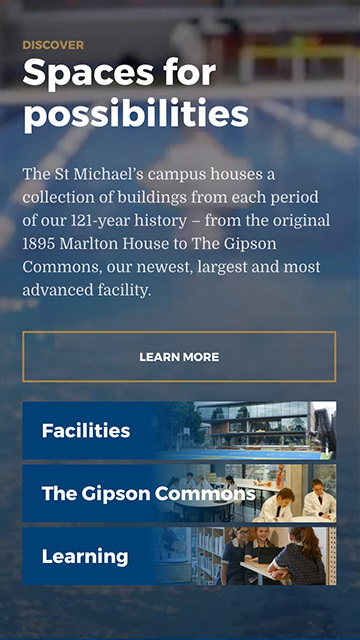 It was important our design showcased everything St Michael’s has to offer, bringing to life the renowned history of the school, a comprehensive curriculum, an inclusive culture, and encouraging students to be ambitious, curious, and adventurous. To truly understand what parents wanted to see when visiting the new website, we set up a Parent Focus Group to uncover core insights. The end result was a website that allowed potential students to feel as though they could truly see themselves at St Michael’s. Following the website launch, we delivered several advertising campaigns driving new student enrolments & scholarships. In collaboration with St Michael’s media partner, MEC, the campaign spanned print, radio, outdoor, digital, and social media.